← The “Christmas Spirit” in Retail. 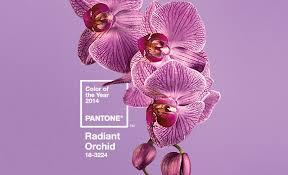 Ok, so the Pantone color of the year is “Radiant Orchid” What are you supposed to do with that information? If you are a floral designer you must keep this in mind when deciding on the latest accent ribbons and containers for the upcoming wedding season. Right? Well… not so fast! In the 40 years I have been a floral designer I can not remember ever having the Pantone color of the year-end up being the color everyone was using that year. Some of the colors have been downright ugly, off trend, or so retro that it was impossible to find the era it was supposed to be from in the first place. Our advice, forget the trend, forget the official color and choose a color you love. Don’t be afraid to use an off-season color if that is what appeals to you. Love spring pastel shades? It is OK to use them in the fall! 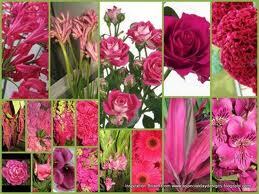 A good designer will help you compose a bouquet with seasonal flowers in any color palette. Let the colors YOU love be the driving force behind the flowers for your wedding!